In the thirteenth century there were three parish churches in the town of Salisbury, the church of St. Martin on high ground to the southeast, the church of St. Thomas adjacent to the market and the church and college of St. Edmund located on the northeast corner of the town grid. Today Salisbury has many churches. 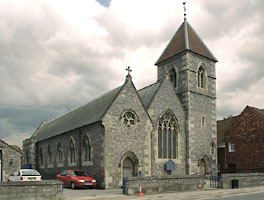 The Church of St. Osmund on Exeter Street facing the east wall of the close was designed in Gothic Revival style by A.W.N. Pugin in 1847-8. St. Edmund's church is discussed in more detail in the essay "Cathedral Schools and Chantry Colleges" by Raymond A. Powell, accessed from the Cathedral page, under Texts and Essays.